When a traveler lands at Raleigh Durham International Airport he can maneuver throughout the airport and find nearby restaurants, amenities and retail shops. 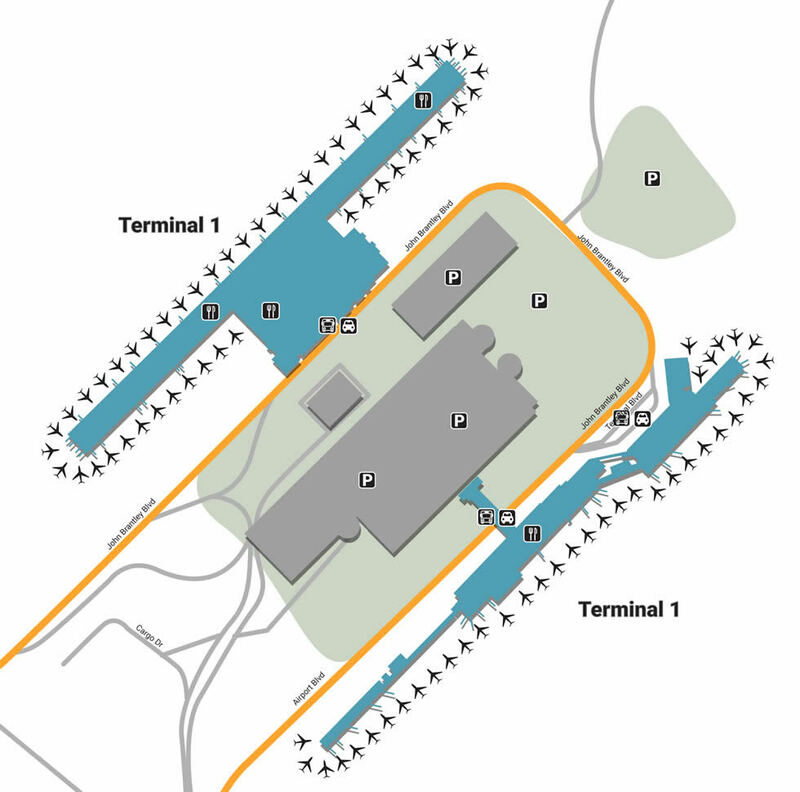 Located north of Morrisville, the Raleigh-Durham International Airport is located between the major city of Durham as well as Raleigh, the capital of North Carolina. Whether you’re traveling for an important business trip or going on a seasonal camping trip, the beautiful backdrop of Morrisville makes the airport one of the prettier places to land. There are four main lots organized under the umbrella of Park RDU's system, offering ample long-term as well as short-term space. The standard parking for daily as well as hourly users is Park RDU Central Garage, which is attached to the airport, offering a short walk to terminals as well as closely-monitored security. For the closest access to terminals as well as ground-level access, consider becoming a Park RDU Premier Member. Long-term vehicles can choose from either Economy 3, which is located off I-40, or the cheapest and furthest, Economy 4, located off U.S. 70. Both economy lots offer free shuttles to and from the airport. With limitless power outlets thought the airport, you’ll never go a moment without your device. The facility also offers high-speed Wi-Fi the first 45 minutes. If you need a cart to haul your bags around, stop by Smarte Carte, located in both terminal curbs as well as the parking garage atrium. For those in need of last-minute gifts, stop by 24-Hour Flower, located in Terminal 1’s The Meeting Place as well as Terminal 2’s baggage claim. Get your boots polished by seasoned shoeshiners at Superior Shine, located in Terminal 1’s Gate A8 as well as Gate C3 in Terminal 2. If a stretch isn’t enough to get that kink out, stop by XpresSpa (Terminal 2, Gate C10) for a luxurious full-body massage. Shop at name-brand stores as well as one-of-a-kind boutiques when you arrive to RDU International. Make your first stop Marshall-Rousso, a decades-old women’s apparel store that’s partnered with the Art Institute of Raleigh-Durham, bringing cutting edge fashion to Terminal 1’s entrance. While you’re there, enjoy the complimentary jewelry store, Ruby Blue, next door. If you need to freshen up with some interesting makeup pallets, head to 3FLOZ, located near Terminal 2’s Gate D10. Be sure to appease the little ones by walking a bit further to Kidworks near Gate D1, or enjoy unique gifts and accessories from the Life is Good Store next-door. Whether you’re starving for something unique or just want a simple pick-me-up, food is always a good way to go. If you’re in Terminal 1, grab a burger and milkshake at Char-Grill, located near Gate A5. If you’re more in the mood for Mexican, enjoy the local ingredients at Salsarita’s Fresh Cantina next-door. Most of the food choices are in Terminal 2’s food court, one of the most interesting being 42nd Street Oyster Bar, located across from Gate C1. If you’re with the family, enjoy a classic dinner or lunch at Carolina Ale House, located outside of Gate C17, or rest easy with familiar salad and pizzas options at California Pizza Kitchen (Gate C9).